I hope you are doing well. I have made a few guides that have been exclusively for my guild, but I do not mind sharing some of them with others. If I post a guide in this forum, will you add it to the main site? Of course, if you do not like it, you are not obligated to add it. Thanks for the reply, Lisette. I recently wrote the guide below for my guild. If you think it's worthy of being posted on this site, by all means, please feel free to. However, please do not feel obligated to post it! If you don't think it's good enough, that's completely fine =) No hard feelings. The following Enchanting Guide was written by Vic, otherwise known as Garou of iGuild in Holic Online. I was able to write the following guide by gathering information from people in the game and from various online sources. Suggestions are extremely important and are fully welcomed. If you find any errors, please post a reply so I can fix them as soon as possible. If there is other information you'd like to suggest I add, please let me know. One of two ways to upgrade items in Holic Online is to Enchant (the other being Strengthening). Enchanting involves a corresponding Strengthening Stone of the same or lower level as the item you would like to enchant. This means that you can enchant a level 45 item using a level 40 Strengthening Stone, but if you try to enchant a level 45 item using a level 50 Strengthening Stone, it will not work. 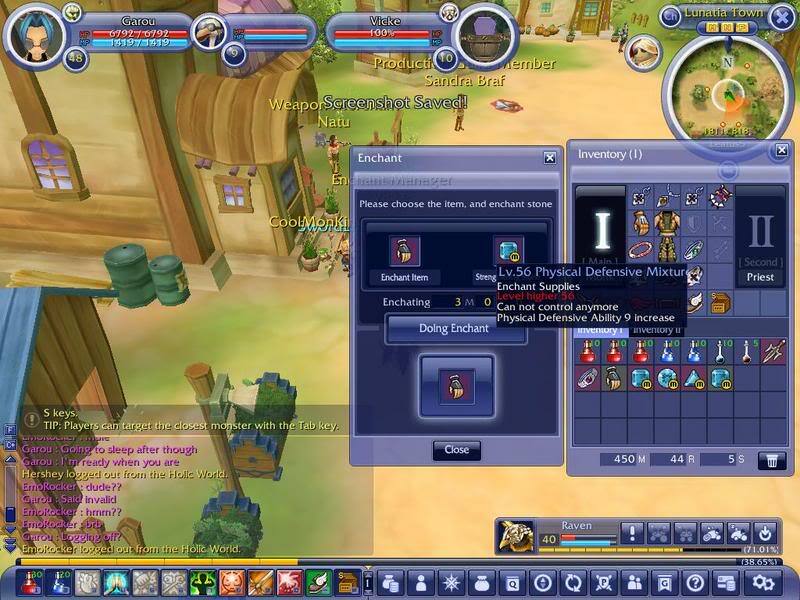 Currently, there are two Non-Player Characters (NPCs) in Holic Online who can Enchant items. 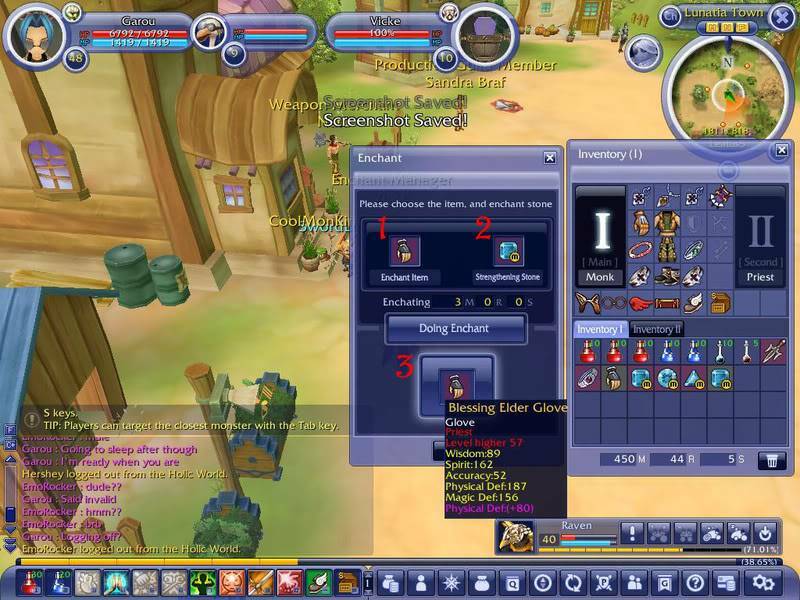 In Nakuru Town, Weapon Merchant Klaus Nunc is in charge of Enchanting items, and in Lunatia Village, players should seek Enchant Manager Vicke for this service. For both NPCs, just choose the appropriate option to Enchant your item. To start, you will need an item that you would like to Enchant, as well as a Strengthening Stone. Items that can be enchanted will have a red line of text that states, "Number of available enchant slots" as "1" or "2." Strengthening Stones come in the following levels: 1, 13, 25, 32, 40, 50, 56, and 63. These Strengthening Stones will provide you with a level-based attack bonus on your weapons or defense on armor and accessories. -Enchanting cannot fail. Your item cannot be broken, and your Strengthening Stone cannot be lost. -Enchanting can increase the damage on your weapons and the defense on your armor and accessories. -Enchanting costs money. The amount, which varies dramatically, is displayed clearly in the Enchant window before you Enchant an item. -Use the stone that is the closest level to the item without going over the item's level. For example, if you have a level 45 item, it is best to use a level 40 Strengthening Stone, not a level 32 Strengthening Stone. -For the best stats possible, use mixed Strengthening Stones. 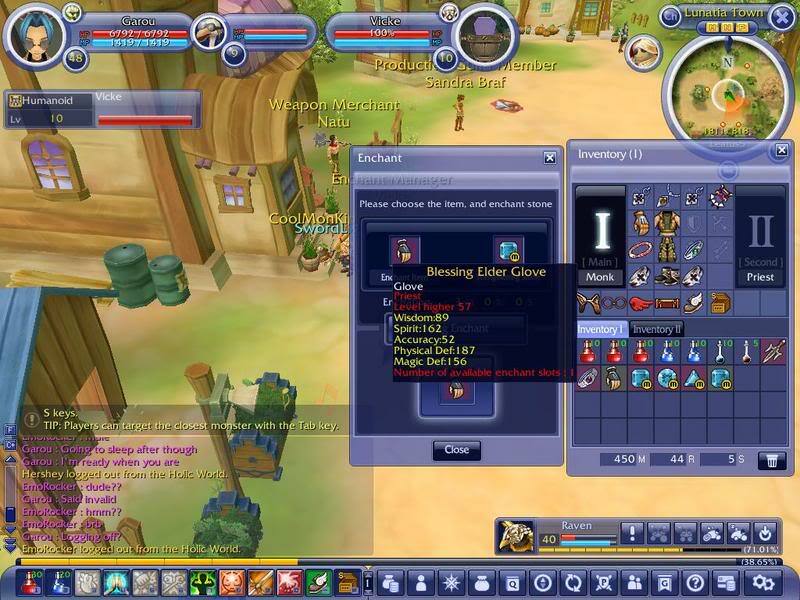 Step 1: Add an item to the "Enchant Item" box (labeled as "1" in the screenshot below). Step 2: Add an Strengthening Stone to the "Strengthening Stone" box (labeled as "2" in the screenshot below). Step 3: After confirming in the box below the "Doing Enchant" button that the stats are what you desire after the Enchant, click on the "Doing Enchant" button (labeled as "3" in the screenshot below). Btw, I think accesories and shield can be enchanted by atk stones too, but I haven't tried for armors. But from my experiences, atk stones only increase a bit =(, so it's better to enchant defense stones. Do you have any ideas of what monsters drops the stones? For example, I wonder if all lv1 - lv5 monsters drops all kinds of lv1 stones, or I have to hunt for certain monsters to get certain stones? Also it seems that lv7 Tulipa Gesneria won't drop a lv1 stones anymore, but I'm not sure whether there's a correlation between monster's lv and the stones it drops. -The thumbnail for Lunatia Town is incorrect; it is actually the thumbnail for the Stengthening Stone section. -Having a map that states the locations of the NPCs in both towns is a very nice touch. Great idea! -Ah, if you are sure about the shield and accessory enchanting, please feel free to slightly edit the guide. I respect your opinions and trust your judgment - after all, you're running Holic Farm! -Umm knowing which monsters drop which stones would be great, but at this moment, I do not have the time and energy to find all that out. Also, I have yet to see anyone state this information anywhere. If I can gather this information, I will contact you at a future time. -Thanks for crediting me so clearly. You can probably just exclude "in Holic Online" so it just reads "Written by Vic/Garou of iGuild." » what will do well in less than 6"?